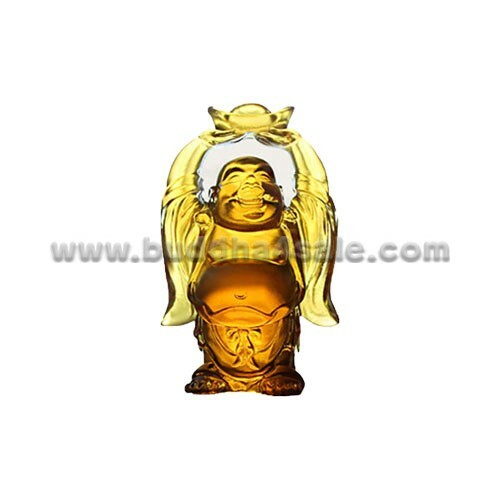 https://buddha4sale.com/product/standing-chinese-yellow-laughing-buddha-liuli-crystal-glass-transparent-car-accessories/Laughing Buddha, also called Maitreya Buddha, Happy Buddha, Fat Buddha, Hotei or the Traveling Buddha. He is often depicted with gold ingots, a Wu Lou (Chinese gourd), a sack of treasures or surrounded by children. Used as a FengShui cure for whatever one wishes for – be it wealth, happiness, satisfaction, good luck, abundance, success, and good health. Usually depicted as a stout, laughing bald man with an overtly exposed pot-belly stomach, or celestial Buddha is better known as Hotei or Pu-Tai. He was a bit too eccentric for a monk, but his heart was loving and open, and in time he came to be loved by many. He is considered a reincarnation of Gautama Buddha (the historical Buddha) and added the often missing energy of light heartedness. But a word to the wise, Laughing Buddha is not the Buddha at all but actually a revered Chinese Monk. It is said that his appearance comes from a Buddhist Zen monk who lived over 1000 years ago. His protruding stomach and jolly smile earned him this name. So all the different types of Laughing Buddha represent the same meaning? Of course not! It symbolizes good fortune coming from heavens. It also brings good luck and positive energies. The bowl depicts a monk’s life. It is associated with renunciation of material possessions and attaining enlightenment. This one symbolizes happiness, joy and good fortune. It is said that waving of fan by Buddha sculpture depicts banishment of troubles and the bottle gourd brings blessings and good health. The Buddha carrying sack symbolizes a traveler. One version is that the sack means that he collects people’s sadness and woes and puts them in his sack. While another version is that the sack symbolizes wealth, good fortune and prosperity. The one with beads is considered to be a monk representing meditation practice. The beads also symbolize the pearls of wisdom. While the ball is considered to be a wealth ball and is said that it brings wealth and prosperity. 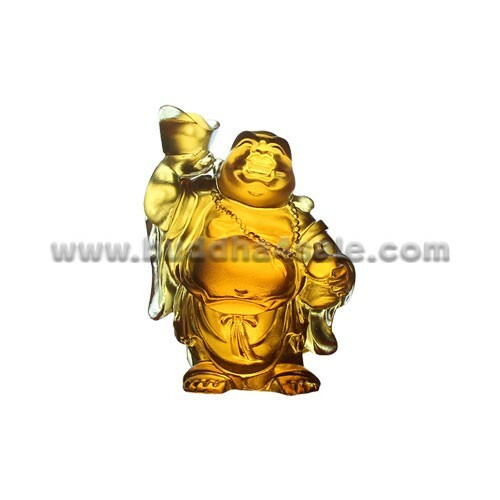 The Laughing Buddha sitting on a large gold nugget and ready to give a smaller gold nugget is a symbol of good luck. The Laughing Buddha holding a gold block with his hands in upright position signifies abundant riches and good luck. The sitting posture of Laughing Buddha is considered to be that of love and it symbolizes balance of thoughts and tranquility. 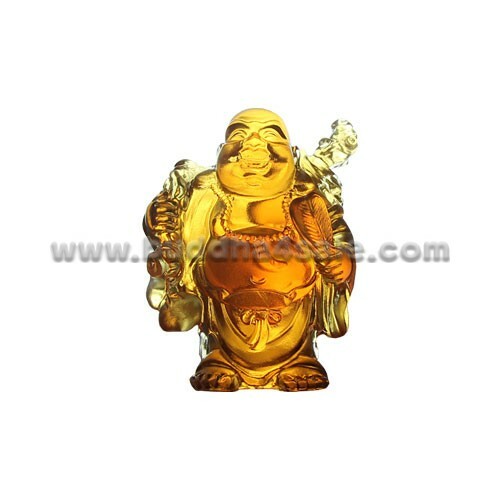 The standing Laughing Buddha symbolizes riches and happiness.